The decades of experience with development and construction of mixing bin units is displayed in the irrigation installations made by Patron Agri Systems. The lifespan of our mixing units is extended thanks to a stainless steel frame and high quality pumps, filters, valves and sensors. Neptunus is a mixing unit designed to fill the day storage tank or directly feed substrate cultivation. The standard version capacity is 20 m³ / hour to 60 m³ / hour and can be increased optionally. In this version, the unit has two connections for fertilizer and one for acid. Of course this can be expanded. 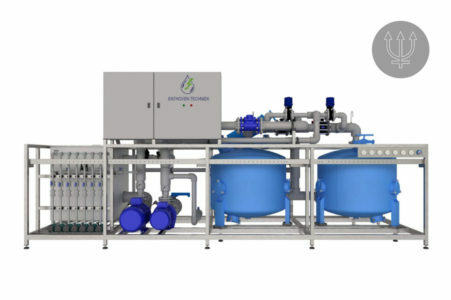 The existing media filter automatically flushes with clean water. In this way no expensive fertilizer substances are wasted and EC is maintained. For maximum control, the unit is equipped with dual pH and EC sensors. Optionally extendable for drain water reuse with an EC pre-control valve. As an alternative to the mixing units, Patron Agri Systems also supplies tailor-made Proteus suction units.